I understand this woman’s plight . . . how wonderful that her coworkers are stepping up to help!! 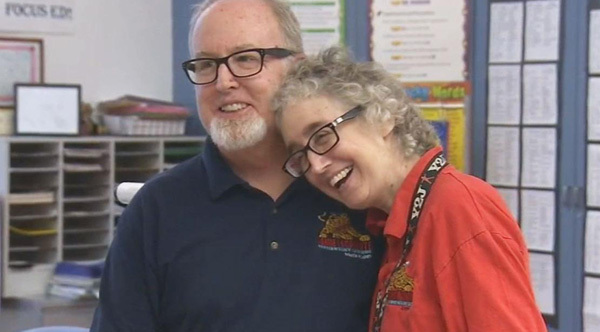 Teachers at a California elementary school are donating their personal sick days to help a fellow teacher who is fighting breast cancer and running short on medical days. Carol Clark is a sixth grade teacher at Jaime Escalante Elementary School in Cudahy and missed all but two months of last year’s school year due to breast cancer. “I started out with the cancer, and then the chemotherapy, and then things got really good and I thought, ‘OK, I beat it, I’m good.’ And then things went downhill again,” said Carol. As a result, Carol had to use her vacation days, plus 120 sick days she had accrued during her 17 years with LAUSD for doctor appointments, chemotherapy and surgeries. But at the end of last year she was out of sick days and still too sick to return to the classroom.